1794 115/55X Soviet Zone - superb mint never hinged collection in the ring binder, nearly complete. As well numerous good issues, as well also varieties. As well MECKLENBURG-WESTERN POMERANIA with unperforated values, childrenÂ´s help set unperforated expertized Thom BPP, East Saxons with 12 Pfg. 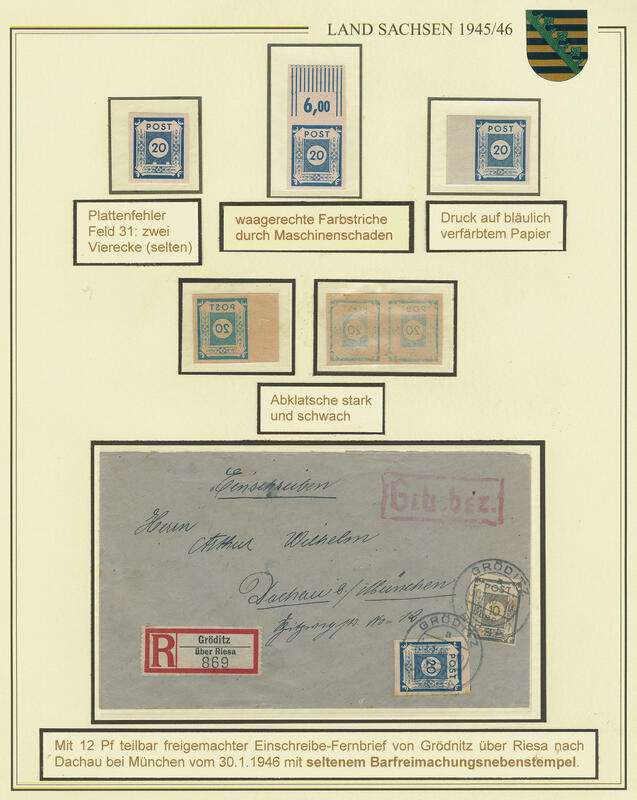 Potschta, postmaster separations expertized Ströh BPP, varieties with unperforated values, Thuringia with small Christmas souvenir sheet, bridge building souvenir sheet, West Saxons, with also Michel no. 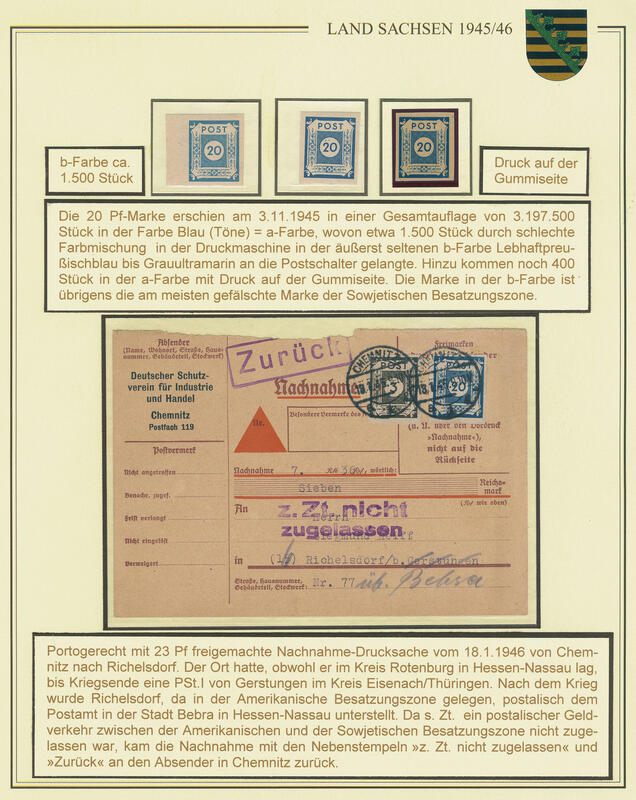 115 / 55 X in perfect condition mint never hinged with photo certificate \"genuine and immaculate\" Ströh BPP (four values), Leipzig fair souvenir sheet pair 1946, Leipzig large fair souvenir sheet 1946 in the corresponding cover, Goethe souvenir sheet 1949 and so on. A very nice collection this favorite area! 1884 /⊙/ Soviet Zone - rich collection in the spring back binder with a lot of material, numerous complete sets, special feature, also an abundant part hand stamp, however unchecked and so on. Much material, please have a look! 1918 ✉ Soviet Zone - interesting collection from covers and cards in the ring binder. As well nice documents including legitimate postage, various postage steps, registered and so on. Attractive object! 1941 ⊙ Soviet Zone - extensive used collection with useful issues in the Lindner hingeless printed form ring binder. Thereby also good part MECKLENBURG-WESTERN POMERANIA including farewell issue on white and gray paper always complete, 12 Pfg. Potschta from margin of sheet on cover with photo certificate Ströh BPP, many further sets, national theater souvenir sheet pair, Leipzig fair souvenir sheet 1946, Goethe souvenir sheet 1949 with appropriate special cancel and so on. Favorable valued! 2092 ⊙ Soviet Zone - extensive used collection with useful issues in the KABE illustrated album, stamp without guarantee. Thereby also good part MECKLENBURG-WESTERN POMERANIA including anti-fascist set, farewell issue with both paper types complete, Thuringia including national theater souvenir sheet pair, as well numerous further complete sets, Goethe souvenir sheet 1949 and so on. Enormous catalog value! 2111 / 80X Soviet Zone - clean and rich collection, in the lighthouse hingeless illustrated album formed, as well numerous mint never hinged issues, good sets and souvenir sheets and so on. Including MECKLENBURG-WESTERN POMERANIA anti-fascist set mint never hinged, better values the farewell issue on white paper mint never hinged, East Saxons, country Saxony with Michel no. 80 X, national theater souvenir sheet pair, bridge building souvenir sheet, Goethe souvenir sheet 1949 and further issues. Favorable! 2210 / Soviet Zone - nice collection, in the number of a major listing complete formed, without Potschta, including small and large Christmas souvenir sheet, bridge building souvenir sheet, Leipzig fair souvenir sheet 1946 with both watermark, as well numerous further sets, Goethe souvenir sheet 1949 and so on. A magnificent object! 2223 / 80X, 150/55X 4 Werte Soviet Zone - superb collection, in the number of a major listing complete formed, mainly mint never hinged with also 12 Pfg. Potschta mint never hinged, 15 Pfg. Country Saxony with falling watermark mint never hinged (Michel no. 80 X), small Christmas souvenir sheet unused, large Christmas souvenir sheet mint never hinged, bridge building souvenir sheet mint never hinged, Leipzig fair souvenir sheet 1946 mint never hinged, Leipzig large fair souvenir sheet 1946, Goethe souvenir sheet and the further issues, also the farewell issue with falling watermark mint never hinged (Michel no. 150 / 55 X 4 values) and so on. Favorable opportunity! 2312 /⊙/ Soviet Zone - interesting and rich collection in the ring binder with lots of material, partly multiple available, with also various paper types, colors, shades, 12 Pfg. Potschta from margin of sheet on cover with CTO, numerous issues MECKLENBURG-WESTERN POMERANIA, East Saxons, Thuringia and so on. Up to general issue. Lots of material and enormous catalog value! 2348 Soviet Zone - nice mint never hinged collection in the safe hingeless printed form ring binder with numerous sought-after issues. With also small Christmas souvenir sheet from the left lower corner of the sheet on white paper, large Christmas souvenir sheet on yellowish gray paper, national theater souvenir sheet pair, bridge building souvenir sheet, Leipzig fair souvenir sheet 1946, Goethe souvenir sheet 1949 and much further material including complete sets and so on. A magnificent object! 2438 / Soviet Zone - rich collection in the Lindner hingeless printed form ring binder, predominantly mint never hinged formed with plenty of better issues. As well MECKLENBURG-WESTERN POMERANIA anti-fascist set mint never hinged, farewell issue on white paper mint never hinged, bridge building souvenir sheet mint never hinged, Leipzig fair souvenir sheet 1946 with both watermark, bridges building center piece and much further material. A magnificent object! 2474 /⊙/ Soviet Zone - enormously extensive inventory mounted on pages with numerous interesting issues, better values, complete sets and so on. With also extensive part Mecklenburg with anti-fascist set, farewell issue on white paper, East Saxons, country Saxony, Holzhausen set mint never hinged, Leipzig fair large souvenir sheet 1946, Goethe souvenir sheet 1949 and much further material. Very favorable valued! 2540 ⊙/ / /✉ 87/89B Soviet Zone - interesting and rich collection with plenty of better issues in the safe ring binder formed. As well numerous good sets, many used issues, souvenir sheets, Leipzig fair souvenir sheet 1946, with also Goethe souvenir sheet 1949, as well numerous attractive covers as for instance Michel no. 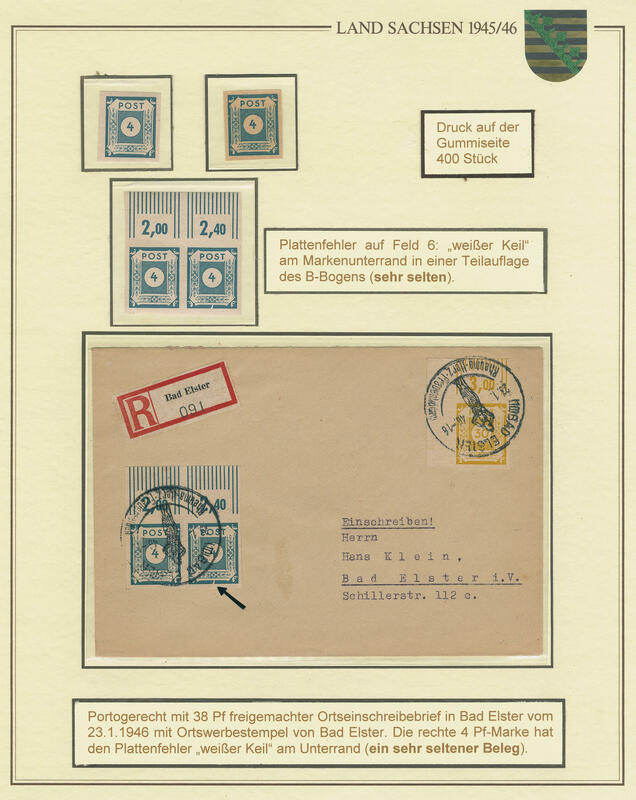 87 / 89 B (reconstruction cut) in corner margin pairs on registered cover, Goethe souvenir sheet stamps 1949 with additional franking on registered special delivery letter to Switzerland with arrival postmark and so on. An attractive object! 2606 / Soviet Zone - very nice and extensive special collection, all mainly mint never hinged formed in two albums, partly with inscription mounted and nice illustrates. Numerous interesting and popular issues, enormously many various plate flaw, imperforated values / part perforation, small Christmas souvenir sheet 1945 twice, center piece from the large Christmas souvenir sheet, bridge building souvenir sheet, Goethe souvenir sheet 1949 and lots of further material. A superb collection this attractive area! 2607 /✉ 53/55 Soviet Zone / East Saxons - superb exhibition special collection the postage stamp issues 1945 (Michel no. 53 / 55) very fine mounted on pages with inscription mounted. As well different values with printed on the gummed side, interesting covers and cards with beautiful documents, 20 Pfg. In the good b-colour mint never hinged expertized Schlegel BPP, 3 Pfg. And 20 Pfg. On rare Cash on Delivery card, 20 Pfg. And 30 Pfg. Always as a single franking on very rarely money orders and so on. An attractive object! 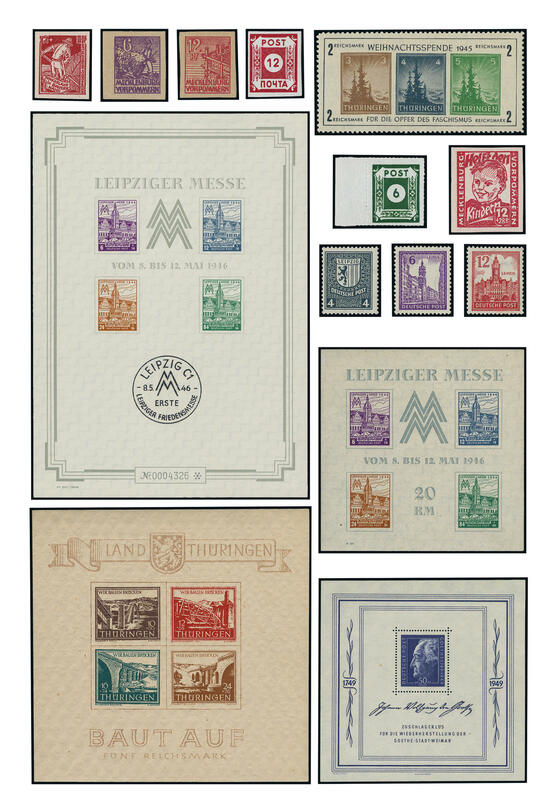 2696 Soviet Zone - extensive mint never hinged collection in the Lindner T hingeless printed form ring binder with plenty of better issues, complete sets, the good Christmas souvenir sheet on white paper, bridge building souvenir sheet, Goethe souvenir sheet 1949 and so on. Very nice object! 2736 /⊙/ Soviet Zone - interesting and extensive inventory in the ring binder with plenty of better issues, as well small Christmas souvenir sheet 1945, childrenÂ´s help MECKLENBURG-WESTERN POMERANIA unperforated, numerous further issues from MECKLENBURG-WESTERN POMERANIA, Leipzig fair souvenir sheet 1946, Leipzig large fair souvenir sheet 1946, Goethe souvenir sheet 1949 and much further material. Favorable! 3361 Soviet Zone / plate flaw - extensive special collection the plate flaw, almost exclusively mint never hinged formed in 11 large thick stock books with numerous sought-after issues from Michel no. 8, as well a strong part MECKLENBURG-WESTERN POMERANIA and many further issues including Thuringia and so on, all nice illustrates. A listing is enclosed. Already the catalogue value the plate flaw collection amounts according to indicated of the consignor approximate 100000,- €. Additional still another mint never hinged special collection Soviet Zone with useful issues, numerous colours and so on, as well a great many expertized values. Please check carefully! 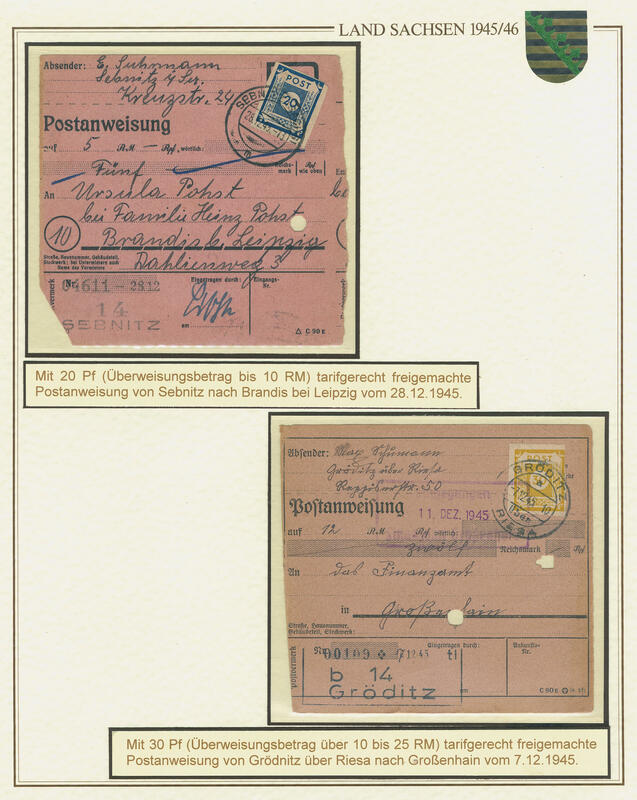 3362 xeF Soviet Zone - extensive special stock in two boxes accommodated, mainly mint never hinged material, as well thousands from plate flaws, approximate 200 complete sheet, as well as well much not be searched material. Also special literature exist. (a listing is enclosed). 3390 xeF Soviet Zone - rich collection in two large boxes accommodated, mostly in ring binders with inscription mounted. As well numerous plate flaw, varieties and special feature from the bear-edition including an abundant part Thuringia and so on. Please have a look!